Lead Time: Typically ships within 2 to 5 business days. Shipping and delivery info: This item ships UPS. Note: Full assembly is required. 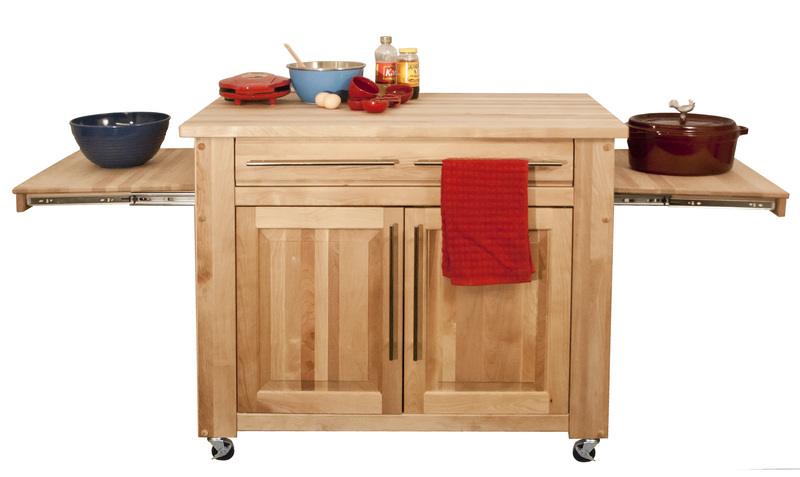 If you could design the ultimate kitchen island, odds are you would describe a versatile, portable cart with ample work space and even more storage space, much like the Empire Island. 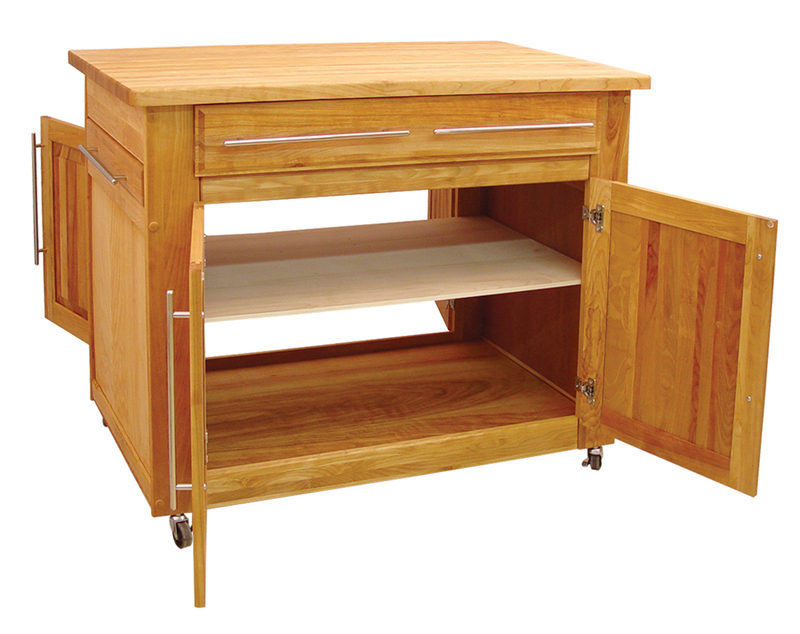 It has a massive hardwood top, a double-door storage cabinet with a shelf and a huge utensil drawer. But its crowning glory is a pair of pullout leaves that make it look as though this movable island could actually take flight. 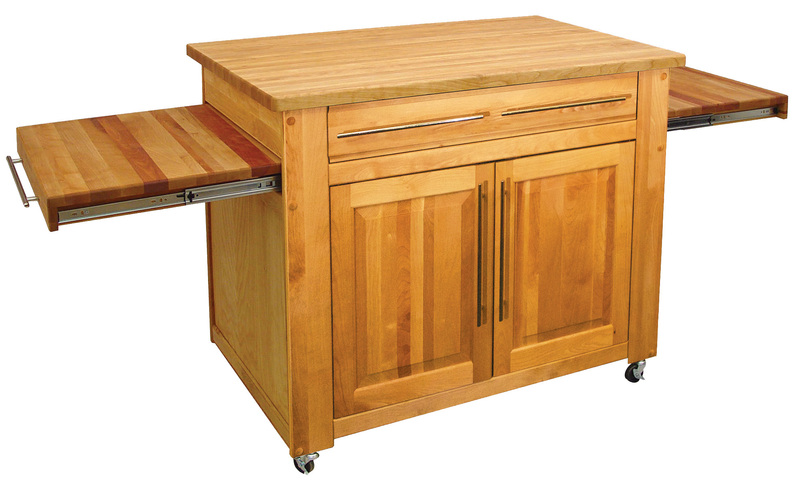 The cart’s main cutting surface – 1.25-inch-thick domestic hardwood measuring 44" wide and 26" deep – stands 36" high. That’s near the high-end of the range of heights deemed comfortable for standing kitchen work. Its leaf wings are lower: only 30 inches off the floor. Each measures 22” wide by 19-1/4” deep and slides easily on full-extension glides. They’re a convenient place to keep ingredients in a holding pattern while you work away on the cart’s main runway. If you’re proficient at multi-tasking, you might consider making it a 3-ring affair. In making a stew for instance, on one leaf you might dice carrots and potatoes, and slice celery and onions on the other. Mix all ingredients in a crock pot on the cart’s main surface, where you also slice the meat of your choosing. 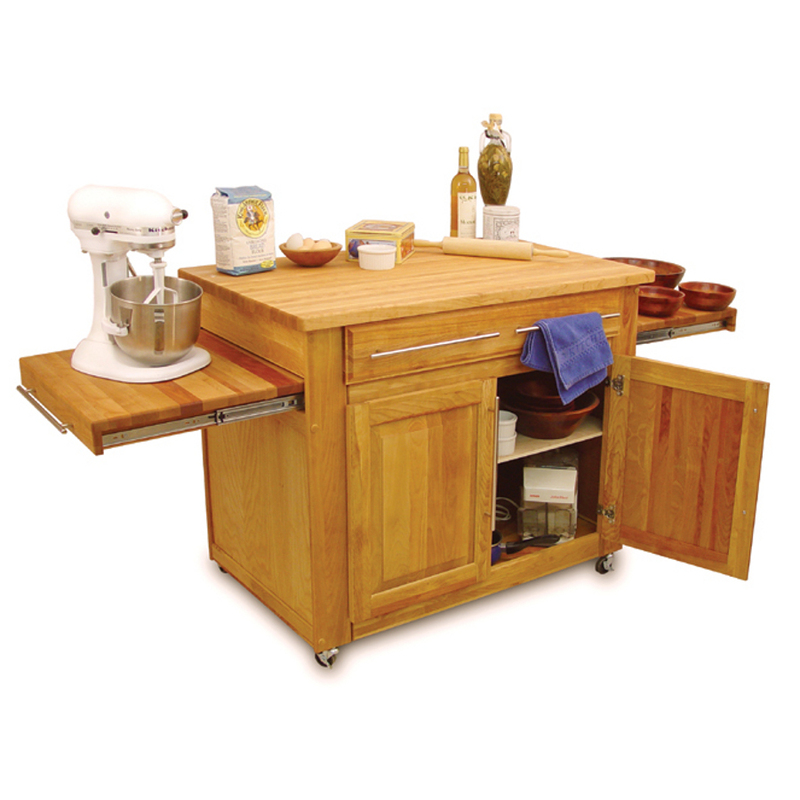 You’ll find that using multiple work areas can greatly improve your efficiency in the kitchen. Like the EI itself, its hardware has a modern look and is designed with ease-of-use in mind. Gain quick, easy access to the Empire’s ample storage space in its 22-1/4” deep utensil drawer and cabinet. 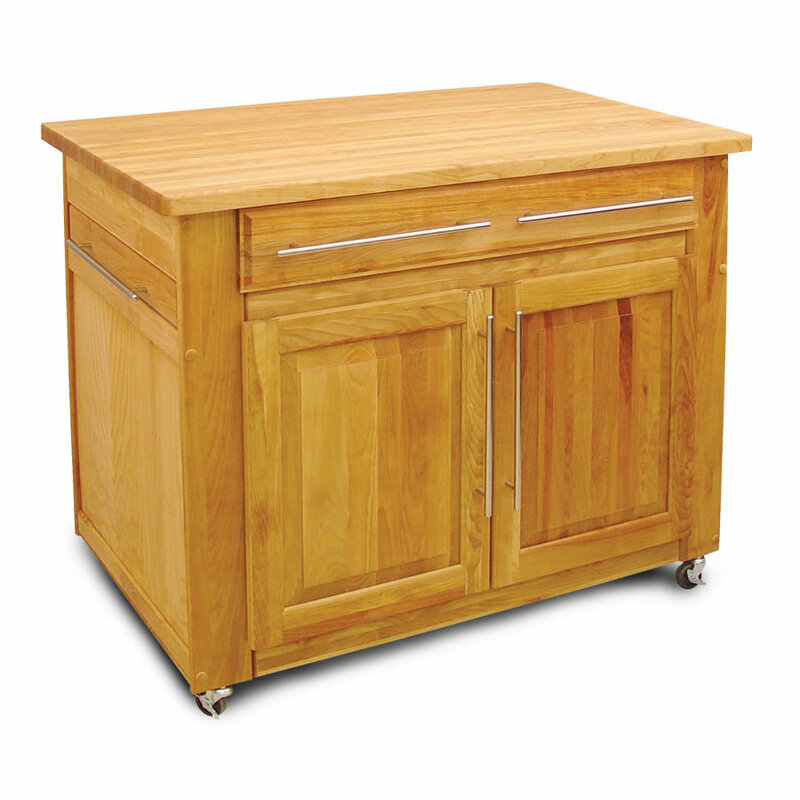 With doors on both sides of the island, you can access the storage cabinet from either side. Another nice plus is that its shelf can be set to two different heights. Catskill Craftsmen warrants parts & labor for 6 months. Catskill will either repair or replace any product it determines to be defective in either material or workmanship. Such repairs or replacements will be made by Catskill Craftsmen, Inc. or anyone the company authorizes, at no charge to the Purchaser. Excluded are damages arising from normal use, accidents, neglect or unauthorized repair. Nor does the company warrant wood or metal finishes to be perfectly free of scratches, blemishes or variations in color or finish. If you change your mind within 30 days and wish to return your purchase, you are entitled to a refund (purchase price less a 20% restocking fee). Merchandise returned must be in saleable condition, unassembled in original packaging and shipped insured via UPS. Be sure to contact us before returning any merchandise. If you find the identical, brand new product for less (including shipping & handling) on another website within 3 days of your purchase, email us the address of the webpage where you found the lower-price offer. If we determine that the website is an authorized Catskill dealer, we will refund the difference. 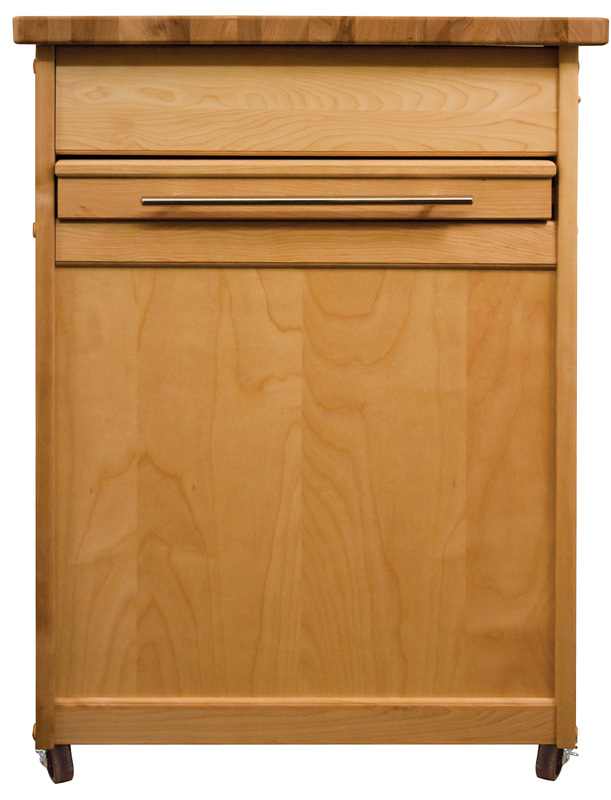 Please note that Butcher Block Co. will not always be able to match a lower price offer (e.g., in cases where doing so would violate legal agreements between us and our manufacturer-partners) and any refund may be limited (e.g., in cases where the competing offer is below our all-in cost). Scroll to browse, or click on an image or text link to shop by proiduct type.